· Races with low prevalence of LNP 10-50% (Central Europeans, Mediterranean): The decrease in lactase activity begins in adolescence. · Races with high prevalence of LNP >70% (Asians, Arabs, Africans, Afro-Americans, Indian Americans): The decrease in lactase activity begins in at 4-5 years of age. For example, Asians lose 80-90% of lactase activity 3-4 years after weaning. The following graph created by Adilac shows the evolution of the lactase activity in the individual and how it decreases in the majority of the population during infancy. In people with LNP, undigested lactose reaches the colon and this is where the intestinal bacteria (luminal microbiota in the colon) consumes it and generates waste substances such as hydrogen (H2), carbon dioxide (CO2), methane (CH4) and short chain acids such as lactic acid, acetic acid, pyruvic acid and butyric acid. This poor digestion of the lactose can cause symptoms of intolerance such as abdominal pain, bloating, flatulence and diarrhoea. However, not everyone with LNP/poor digestion presents symptoms of lactose intolerance. LNP: This is the decreasing regulation of lactase activity due to a genetic determination. 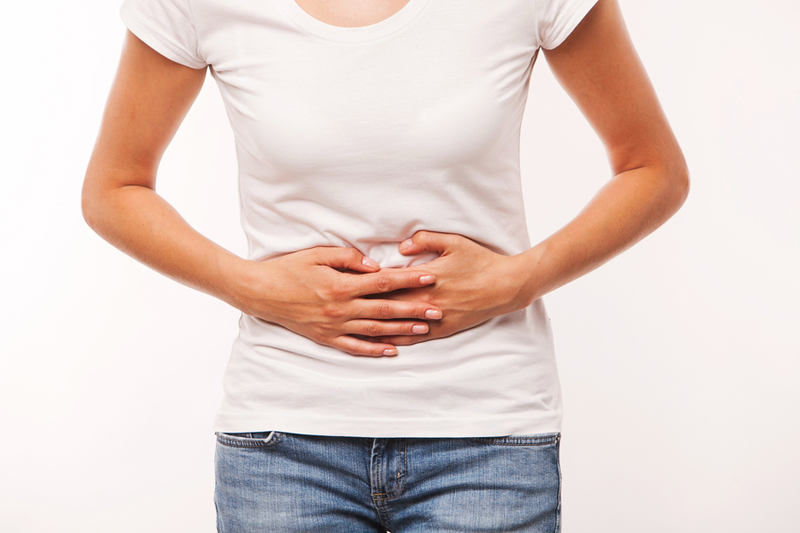 Poor digestion of lactose: This is the inability to digest lactose for a primary or secondary reason, causing undigested lactose to reach the colon. LI or Lactose intolerance: Group of symptoms after the consumption of lactose in the form of bloating, flatulence, diarrhoea, etc. The gastroenterologist avails of a series of objective tests that allow them to assess the LNP (genetic test, small intestine biopsy), POOR DIGESTION (hydrogen test, glucose tolerance test, Gaxilose test). 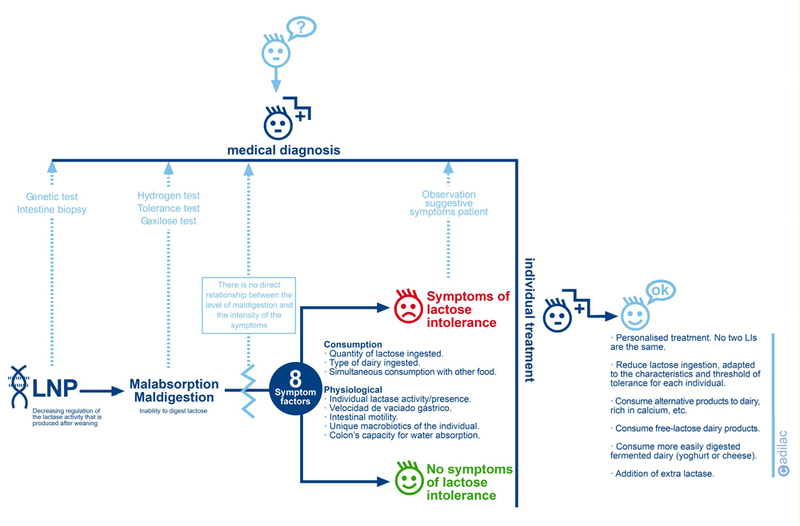 However, the final diagnosis of LI is difficult because it can only be carried out by the specialist doctor in observation of the ‘subjective’ symptoms detected by the patient such as diarrhoea, bloating, gases, etc. Therefore, a patient must never carry out any of the mentioned tests without medical prescription and observation, thinking that any of them are sufficient to diagnose their LI because they could obtain an erroneous self-diagnosis. Also, not everyone with LNP/poor digestion suffers from LI (symptoms). There is no direct relationship between the level of poor digestion and the intensity of the symptoms. As can be seen in the upper graph, there are various factors, some related to food consumption and others to the physiology of each person, that influence the appearance or not of symptoms and their intensity. In this sense, there is consent that the two principal factors that influence the appearance of symptoms are the quantity of lactose ingested and the colon’s capacity for water absorption. Therefore, in this clinical situation we can find four possible cases (graph). The only treatment for lactose intolerance is the following of a reduction/exclusion diet of the same, adapted to the level of tolerance of each individual with poor digestion of lactose. As there is so much variation in the individual tolerances (we always say that there are as many levels of tolerance as people) we cannot establish a single threshold for lactose for everyone with lactose intolerance in a generic manner. Although we must make reference to the Scientific Opinion report by the EFSA (2010) which establishes some conclusions extracted from different study panels that can serve as a guide. · The majority of those with poor digestion or LI can tolerate 12g of lactose in a single dose (if ingested with other foods) without presenting symptoms or very mild symptoms. · Many people with poor digestion or LI present symptoms that are noticeable at single doses of 24g but tolerate daily doses of between 20-24g distributed throughout the day (if ingested with other foods). · The majority of those with poor digestion or LI present severe symptoms if they consume 50g of lactose throughout the day. · Some people describe the appearance of symptoms after ingesting 6g of lactose. These conclusions confirm that the consumption of lactose together with other food and distributing its ingestion over the course of the day can help certain people with their tolerance, but in short, there is no single threshold for all those who suffer from LI.